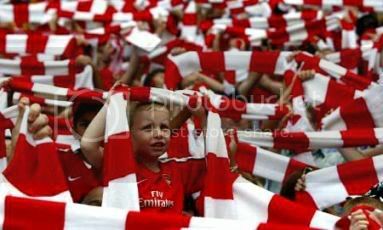 as we all follow the arsenal! terimakasih atas kontrak barunya rvp..
kami butuh pemain seperti anda, baik dari skill maupun loyalitas nya..
kami tunggu gol gol kungfu ala vs charlton 06/07 dulu..
BBC's Goal of the Month! The goal of a lifetime! he's only 25 years old. baru nyadar gw, lumayan muda gan! 5 Agustus (ato 4 ato 6 Agustus yah?) nanti juga jadi 26..
Komentar Van Persie atas perpanjangan kontraknya. "There is ambition. I have spoken to both the boss and [chief executive] Ivan [Gazidis] about it. They have really worked to get a really good team for next year. The boss got some stick from some of the fans last season, but if you look at the reaction at the end of the last game, that was tremendous and is the way all of the fans should react." "I trust him and my message to everyone is: be patient, trust the team and the people above." "This team has lots of potential and it is really important we stay together and fight for the same thing." pemain loyal... bakal jadi legenda arsenal. semoga gol makin banyak musim-musim ke depan, lampaui rekor henry.